Can you believe it's already the first of March? It's insane how quickly 2017 is going by, I can hardly remember what I did in January and it hasn't been long since the beginning of the year. 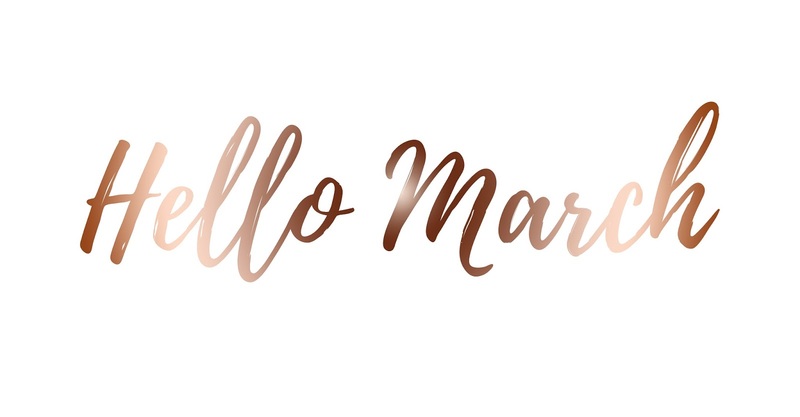 Although I have my Weekly Round Up and Monday Motivation posts, I felt I still had to do my usual "Hello...." post at the beginning of this month just to reflect on what's happening in the next month and how well the past month has gone. Honestly, not a lot in my life is happening during March. I do not finish University until May, so I don't have that excitement and I've already handed in my presentation instead of handing in on my deadline which is the 20th. The worst about March and University is how my tutor is leaving to go into another job and she was the only one I liked. The even worst picture of all of this, my horrible college tutor might be my new uni tutor; ugh! What a hell hole it's going to be. Today Willow is eleven weeks old and she's having a second injection meaning we can finally walk her! I cannot wait to get her out and about, walking every where and training her to be an incredible walker on the lead. Having a new puppy in your life definitely gives you that feeling of having a purpose. I'm sure some of you will know exactly what I mean. I want to try and put more effort into my blog this month. Last year I was always so ahead with scheduling posts and tweets etc, and now I'm writing up posts at the last minute before I go to sleep so they're ready to be published the following morning. What has happened to me? Why am I doing this to myself. I recently found That Lame Company and Chloe has really motivated me to push myself, get organised again and get on a role with my blog. I enjoy the start of new months, they push me to always be a better version of myself. Are you doing anything exciting during March? I'd love to know! I love the start of a new month because it's like having a clean slate, although I should probably treat every day like that! You have a beautiful blog, Kimberley! I'm so happy I stumbled upon it through one of BloggerTribe's retweets. Happy Friday!